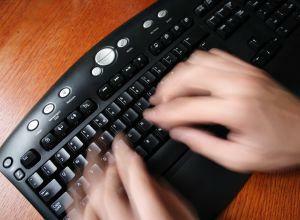 Ghostwriting involves writing on behalf of a client without expecting credit or acknowledgment for doing the work. When you work as a ghost writer, you won't get a byline. Instead, the client who hires you is credited as being the author of the piece. Breaking into ghostwriting is not necessarily easy since many large publishing houses prefer established authors or writers. However, individuals who specialize in a niche and promote themselves can find a way inside this well-paying market. Probably the most common market for ghostwriting is books, but this sector is about more than celebrities wanting someone to ghostwrite their story. It also includes experts and entrepreneurs who have an idea they want researched and written. If you are just starting out, though, do not expect to land a book ghostwriting deal. Most publishing houses are seeking established writers who have already handled one or more large projects. However, seasoned writers can contact the publishing house by sending a resume and a cover letter explaining how they are a good fit. Use an online database. Databases, like the one maintained by Poets & Writers, provides a regularly updated list of agents and agencies that represent poets, fiction writers, and creative nonfiction writers. The database also includes the type of books the agents prefer to represent. Purchase a directory of literary agents. Each year F & W Media updates its hardbound copy of current literary agents available for hire. The book retails for about $30. Join an organization like the Association of Ghostwriters. This type of organization is one way for writers to keep their name in front of editors. Mediabistro: This job board specializes in freelance work as well as the various branches of the media, including advertising, marketing, social media, and journalism. PRWeek jobs: This job board is part of the PR Week website, a site that reports on the news and trends associated with the Public Relations industry. Craigslist: Scan the local job board on Craigslist and search for terms like writing, editing, ghostwriting, or copyediting. Upwork: With this site, writers bid on a writing projects. One potential concern on bidding sites is placing too low of a bid (and being underpaid for the work created). Ghostbloggers: With Ghostbloggers, writers create blog content which is placed in a queue for purchase. The downside is the possibility that the work is not purchased. BlogMutt: This company specializes in ghostwritten blogging content for external clients. Even though many companies keep a PR or marketing person on hand to handle much of the writing for brochures, content requirements have expanded with social media. Firms now find themselves needing to create content for blogs, white papers, and social media interaction. Landing work with a corporation often relies on networking or knowing someone. However, those with no inside track can land a position by identifying the correct individual--often found on the company's website--and then making a pitch via email or letter. Monster: With 20 years in the business, Monster is one of the oldest online job boards. Besides job listings, the site now also offers advice on career management and maintains a daily blog. Indeed: This site bills itself as the largest online job board with 180 million unique visitors every month from more than 50 countries. Like most online job boards, writers can post their resume online so potential employers can view their qualifications. CareerBuilder: One unique angle of this site, which has more than 24 million unique visitors a month, is its partnership with 140 newspapers in the United States. SimplyHired: Comparable in size to the other online boards listed here, this site currently boasts more than 6 million job openings worldwide. On each of these sites, use search terms, such as ghost writing, ghostwriting, or ghost writer and set up an email alert to have the job postings delivered to your inbox on a daily or weekly basis. Upwork: This site requires a membership (which is free). This is done to facilitate the transfer of projects and pay. Writerfind: Writerfind posts all types of writing opportunities including ghostwriting. FreelanceWritingGigs: This is a frequently updated blog that lists various freelance writing positions. ProBlogger: This job board specializes in blogging and ghost blogging. Growing and maintaining a successful ghostwriting career is often a matter of specializing in a niche, building up a portfolio of well-written articles, and marketing oneself. Going it alone is a bit daunting, which is why some ghostwriters join journalism, PR, or ghostwriting organizations, since each of these associations can help a writer network and find additional, viable work opportunities.